The discourse of Confucian Capitalism has been crucial in shaping our understanding of the brilliant economic successes of the Chinese diaspora all over the world. From this perspective, hard work, family values, and communal cohesion, as well as business practices based on sentiment, trust, and social networks, are the legendary means of explaining the wealth and commercial talent of these remarkable people. The book examines the subject of Chinese business' by exposing the enduring myth about the determining effects of these values and practices supposedly derived from Confucianism. Such myth relies on an ahistorical and essentialised notion of Chinese Culture', and brings into focus three sites of controversy: the economically driven Chinese subject, work-place relations characterised by consensus and cultural sharing, and an operating ethos of collectivist, pre-capitalist sociality. In its interrogation of the discourse of Confucian capitalism, it is the aim of this book to arrive at a critically informed and socially realistic understanding of Chinese business. The author combines abstract analysis with examples from anthropological fieldwork among Chinese traders in Sarawak, East Malaysia. 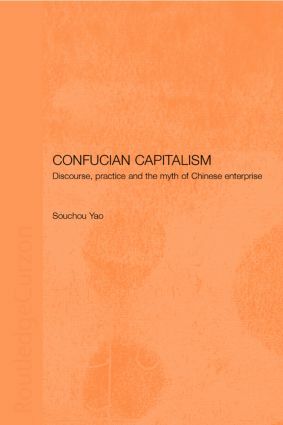 By anchoring theoretical discussion to real case-studies, the multi-disciplinary approach of this book offers a useful insight into Chinese business activities, and contributes to current debates in cultural studies, economic anthropology, the economic performance of overseas Chinese, and neo-Confucian societies more generally.